New wiring throughout including engine loom and new switch board panel all carried out by Hayling Yacht Company. New worm drive for Starboard engine. New Fire Extinguishers in cabin and engine bay. New Radar, Plotter, Radio and UBS Ports for charging I Phones etc. New head lining in main cabin throughout. This Fairline also has a foldable radar arch which makes this boat at home on the sea or rivers. The hull has also had a full application of Copper Coating applied by a local specialist with approximately 3 years remaining of the guarantee. 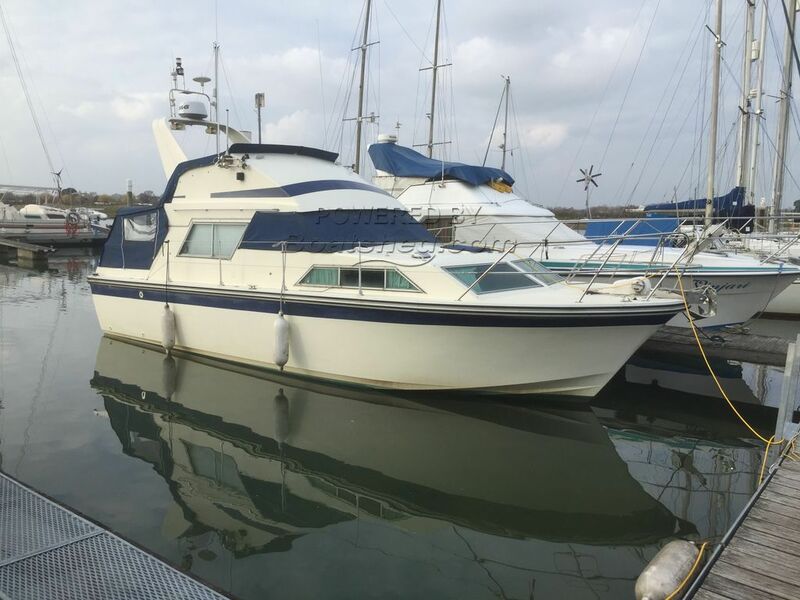 This boat would make a great family cruiser or even a 'live aboard' and for a boat of 32ft she is very spacious inside with plenty of accommodation space. This Fairline 32 Sedan has been personally photographed and viewed by Bruce Mowatt / David Mowatt of Boatshed Hayling Island. Click here for contact details.